Created by the Finnish company Rovio Entertainment, Angry Birds (a mobile downloadable game) first debuted back in December 2009 for Apple iOS. Drawing inspiration from “Crush the Castle” (a mobile game developed from Armor Games), Angry Birds has been praised by many for it simplistic nature of fun gameplay and comically style (all of which is at low “downloadable price). Since its initial release, millions have been captivated by this game as Rovio as rolled out newer editions (with new levels) as well as released port version of it on other smartphone (Android, Symbian, Windows, etc.) and video game consoles and PC ports. The marketing for Angry Birds also went beyond the mobile game app, with clothing attire, plush dolls, merchandise, and a cartoon TV series. This all brings back around as Rovio and Sony Pictures Imageworks releases the first feature film for this iconic game in The Angry Birds Movie. Does this movie fly high or is it “too little, too late” for this project endeavor? On Bird Island, Red (Jason Sudeikis) is a peculiar bird with a hot temper, who lives on the outskirts of his happy and cheerful community. His latest violent bursts of anger and frustration has landed him a court-ordered anger management class, taught by Matilda (Maya Rudolph). Meeting fellow outcasts, Chuck (Josh Gad) and Bomb (Danny McBride), Red finds kind spirits, but his rehabilitation to pacify his anger is put on hold when King Leonard (Bill Harder) and his pig army arrives on the island, with friendly offerings and gifts to the flightless birds. While the locals take a shine to the pigs, Red has his suspicions. With Chuck and Bomb at his side, Red investigates the pigs and their true reason for visiting Bird Island, ready to go to war with their new “swine” enemy, but also lacking the ability to fly to launch an effective attack. I’ll admit that I was one of the people who play Angry Birds (I still even play now and then). I was a little to the Angry Birds craze, for when I downloaded the original game, there were already several other spin-offs game in the app series. Still, for what it was, Angry Birds was enjoyable mobile app (and still is a bit), passing the time away when I’m waiting somewhere (though I prefer to play the Candy Crush series). When I saw the trailers for The Angry Birds Movie, I was a little perplexed that a movie studio would actually concoct a full-length animated film that was based off of a game such as Rovio’s Angry Birds. Skeptical and not reading too deep into early reviews for the movie, I went to see Angry Birds on its opening weekend. What did I think of it? Well, The Angry Birds Movie, while having a few good marks, is very much a hollow feature that’s more noise than storytelling and really doesn’t offer much beyond its intial concept. Directorial-wise, The Angry Birds Movie is shared between Clay Kaytis and Fergal Reilly, both of whom have had experience in the movie industry (Kaytis as an animation supervisor and Reilly as a storyboard artist), but both make their directional debut with this movie. Visually speaking, this film is beautifully rendered with CGI animation. The environments in both Bird Island and Piggy Island are awashed with bright colors and intricate details. Along those same lines, the character design for the various characters (both major and minor) are also very detailed, each one given a distinct look and not given the illusion that they are just “carbon copies”. The humor in the movie is okay (nothing groundbreaking) as the voice talents behind the characters’ help elevate that. 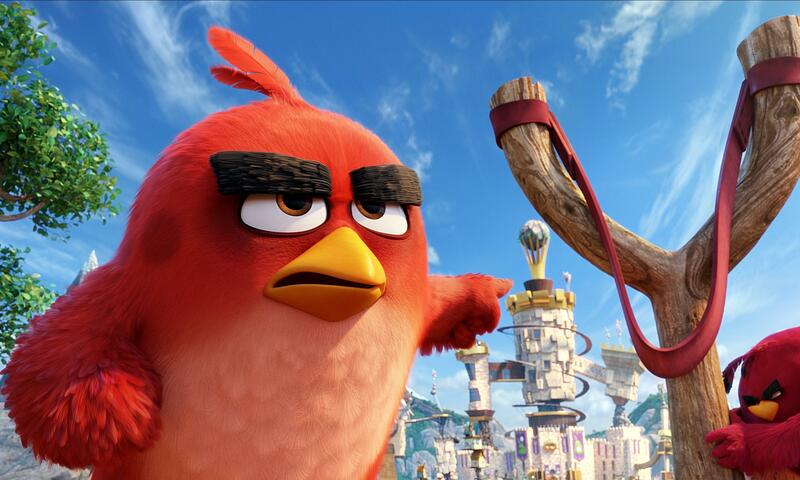 As a side-note (and caution to some), there are more than a few adult risqué jokes found The Angry Birds Movie. Naturally, some kids (the younger ones) won’t get them, but some of the older ones (and also adults) might pick up on them. It seems a little bit awkward in a movie like this, almost a little cringe worthy as I personally question on why they decided to put these adult jokes in a very kid-ish movie. The really big problem with The Angry Birds Movie is, of course, its overall tardiness to its own popularity. While there are those who still play the mobile games, Angry Birds (as a brand) is well into the elder years’ of its life spanning. It’s just not that popular as it used to be. Thus, the movie itself feels like a last ditch attempt by its creator to capitalize on the brand, similar to other once-popular brands that tried to do that (i.e. High School Musical (High School Musical 3), Hanna Montana (The Hanna Montana Movie), Glee (Glee Live! In Concert), etc.). If this movie was released during the height of its popularity (roughly 2012 or 2013), it probably would’ve been successful and relative to the market and to its brand. However, releasing The Angry Birds Movie in 2016, has lost its initial “flair” and “excitement” and, in general terms, its overall appeal as an animated film. 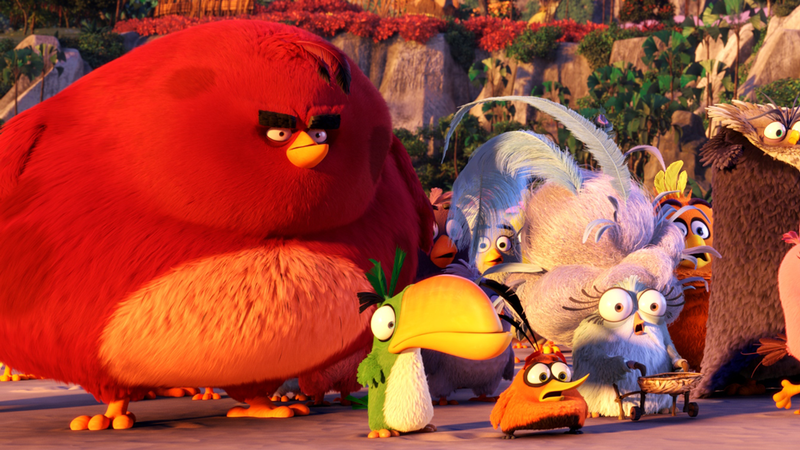 Another problem that The Angry Birds Movie faces is in its storytelling department. It goes without saying that the Angry Birds games never really had a “gripping narrative” to tell. Its story was simply in nature (the pigs steal the eggs and the birds fight the pigs to get eggs back). So one would think that the movie’s screenplay (written by Jon Vitti) would offer something to try to engage viewer by greatly expanded that simplistic premise. Unfortunately, Vitti (and even Kaytis and Reilly) don’t really “bulk” up the movie’s narration, beside the commonplace themes that are usually found in any classic animated tale (the outcast, the outcast’s misfit friends, and the turn of events that proves that the outcast really belongs). Yes, it’s a tried and true formula, but The Angry Birds Movie does it in a way that makes it boring and unoriginal, adding little to none of its own creativity or individual to this common story outline. In truth, it’s an okay story, but I wanted to see the movie interject its own ideas rather than a “bared-bones” narrative. Like a lot of video game adaptions film (most recently notable in Ratchet and Clank), the movie itself is more about concerned about “selling” the brand rather than creating its own “identity” and being an off-shoot extension to that same brand. Coinciding with that knowledge, the movie’s third act is VERY bombastic. Sure, it does capture the spirt of the Rovio’s games as viewers see Red, Chuck, Bomb, and the rest of the Bird Island inhabitants fly throw the air (via a giant slingshot) at the Pig Island community, smashing through buildings and knock them down. The flip side is that the movie sort of devolves into a chaotic madness with a lot of noise and visuals exploding onto the screen. Within a flash (and with its characters not resting), this happens, then this happens, then this happens, then this happens and so on and so forth. The movie does it so fast it becomes a like cacophony of bright colors and loud noises that can be a little numbing for viewers. With its story weak and more concerned with its mobile app appeal (the game aspect), the characterization of the movie’s cast of characters are, more or less, flat and generic. What ultimately helps the movie (in that department) is the colorful voice talents that each one are respectfully playing. Jason Sudeikis, Josh Gad, and Danny McBride seem to be having fun in their roles as Red, Chuck, and Bomb (especially Gad), while Maya Rudolph, Bill Hader, Keegan-Michael Key, and Peter Dinklage share a similar fun interest in their roles as Matilda, King Leonard, Judge Peckinpah, and The Might Eagle respectfully. Other voice talents include, Sean Penn, Tony Hale, Hannibal Buress, Kate McKinnon, Billy Eicher, and Blake Shelton, who make up some of the various characters that appear throughout the movie. While all these talent individuals do solid work in voicing their characters, it’s just a shame that their talents are (collectively) wasted on this movie. 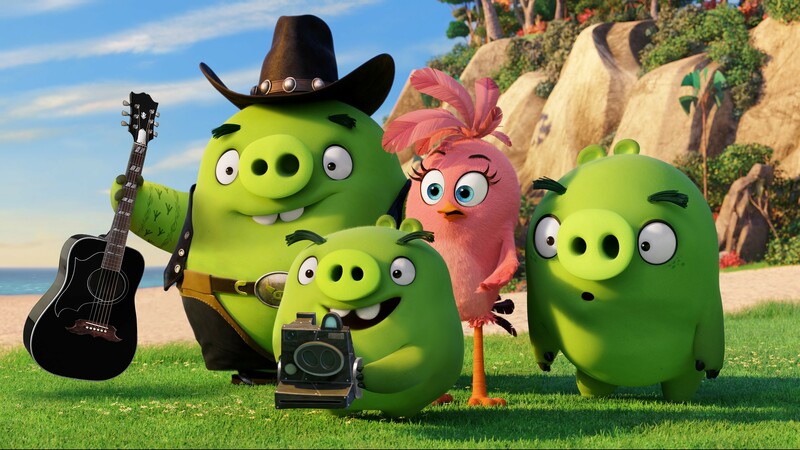 Its birds vs. pigs in the animated feature The Angry Birds Movie. Clay Kaytis and Fergal Reilly’s movie that’s based off of the once uber-popular mobile game feels exhausting from start to finish. Sure, they animation is solid and the voice talent is great (albeit wasted on this cartoon endeavor), and there are few fleeting moments of hilarious entertainment, but, for the most part, the movie is loud, noisy, unoriginal, and a tad nonsensical. To me, it was okay as I didn’t have high expectations for this movie. However, being a fan of animated movies, I was disappointed that they even try to make a movie based of the game (again a quick cash-and grab from studio execs). If you have young kids or just super-duper excited to see this Rovio’s iconic game on the big-screen, then The Angry Birds Movie is for you (as a rental). For everyone else, it’s an easy “skip it”. Just what happens to the character “Red” at the beginning of the movie, The Angry Birds Movie arrives too late to the party for moviegoers to really care about.